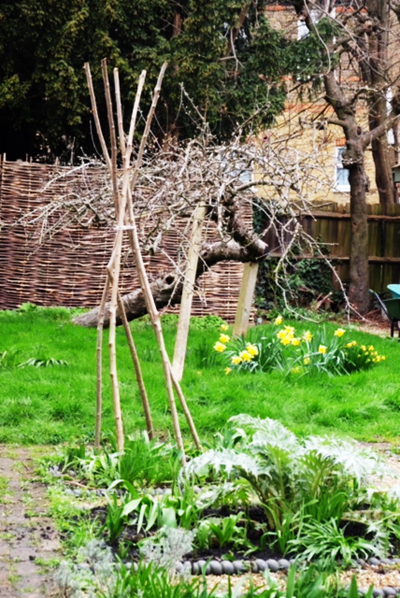 Papery pink blossom petals drift across the fence from Clare’s ornamental cherry joining the general budding in my spring garden. Furry apple tree buds are poised to unfurl, the hard pruned roses ( you can never prune a rose too hard) are peppered with nascent pink shoots. I don’t go so far as to describe it as lawn, but the grass is already the optimistic electric green of mid spring , a newly laid patch of turf is particularly thick and lush. Time for an outing with the hand (good exercise) lawn mower. 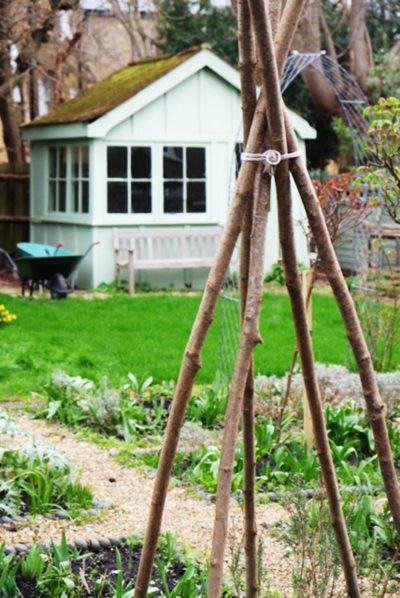 Living in the city and driving a cabin baggage sized Suzuki Aalto are no obstacle to procuring long lengths of hazel with which to build wigwam structures at the four corners of the herb and flower beds. 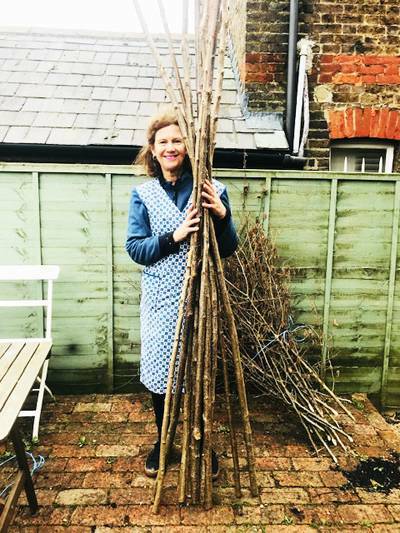 Only a few clicks on EBay led me to Graham who coppices woodland in Henley on Thames and delivered an 8ft bundle of twenty sticks plus twiggy peas sticks for making simple supports to prop up scrambling sweetpeas. Some deliciously scented varieties are on order from Ashbridge Nurseries who are also sending more lavender. I have yet to consider the further fate of the already fated box hedging on the north house wall. Ravaged and stinking with box blight in a matter a of days it was a shocking sight on my return from a trip last summer. There is some regrowth but not much. 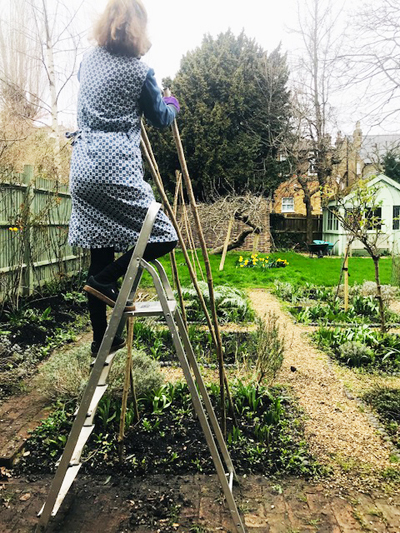 The plan is to train Jack and the Bean stalk-like swathes of scarlet runner beans and white flowered French beans up the wigwams. That is, of course, if we are able to keep the munching slugs and snails at bay. In the knowledge of last year’s dahlia carnage I am going to be super alert keeping watch over my crop like a tiger mother of the garden. An over night patrol plus big torch would be ideal. A daily squashing session more likely. In my experience snails are as sly as they’re slimy, gliding with uncanny speed especially over glossy rained upon earth. What with the locust effects of box blight it seems as if the recent hot summers and warm winters might also be aiding the garden wars.